I haven’t mentioned my “girlfriend” in a long time. This is not only because I don’t like to talk about certain aspects of my private life here; it’s also because I’m not sure what to call her anymore. This is all due to the peculiar features of getting married in China. You see, we are already legally married, but we have not yet had a “proper wedding.” To her and her family, that means a proper Chinese wedding banquet. To me and my family, that means a proper wedding in a Catholic church. All that will happen next year. I can call her my 老婆 in Chinese and this isn’t strange at all… Many Chinese couples here call each other 老婆 and 老公 long before they’re married (which really kind of annoys me for some reason). But calling her my wife–in English–feels wrong to me, because my whole life my idea of my “wife” has been the woman I spend the rest of my life with after we go through that sacred ceremony in church. And we haven’t done that yet. In China, the wedding banquet has tremendous social significance for both families, but no legal standing. I know a Chinese couple who waited for years for the wedding banquet because they wanted to be legally married but couldn’t yet afford a nice reception. I also heard of a couple that had the wedding banquet but then split up and were never legally married in the first place. In the US, saying “I do” in a ceremony in front of a priest and other witnesses is a part of the legal process (in addition to the marriage registration). So basically the feeling I get is that we’re taking that minute or so when the man and woman each say “I do” and the priest pronounces them husband and wife, and stretching it out to about a year. It’s a little strange, but I don’t think it’s all bad. Marriage is, after all, a big adjustment. Update: Dan Washburn recently had a similar marriage experience. While home my sister took me to see some stand up comedy here in Tampa. Two of the comedians were John Heffron and Tracy Ashley. We had a good time. The next day I was talking to my girlfriend on the phone, telling her what I’d been doing, and I wanted to tell her that I went to see stand up comedy. But I completely did not know how to say “stand up comedy!” I went into a long-winded description of the event which left me completely convinced: I need to know how to say stand up comedy in Chinese! Shortly thereafter, I was chatting with Brendan online, and I asked him if he knew. Big xiangsheng fan that he is, his response was “单口相声” (one-man xiangsheng). That was a clever way of putting it, and probably pretty easily understood by the Chinese. I later did a proper Google search and turned up 现场喜剧 (live comedy), which often had 表演 (performance) tacked onto the end. You can find such a usage on the Chinese version of the Wikipedia entry for David Letterman. (That source strikes me as a particularly good example of the surreal beauty of the internet.) I have my doubts as to whether 现场喜剧 can be readily understood by most Chinese as “stand up” without further elaboration, though. All this entry illustrates–if anything–is that when you bring stand up comedy together with Chinese culture, it’s a little awkward. This is dedicated to my commenters that hate my professor because he discusses his quirky off-topic theories in class. P.P.S. 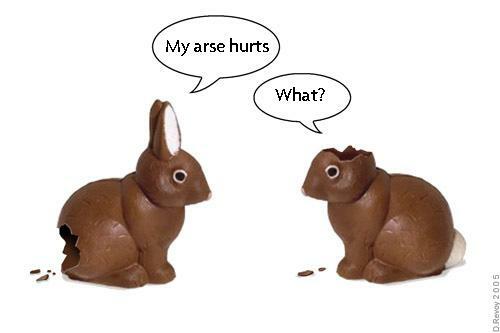 I don’t believe in any “war on Easter,” but as a Catholic I do believe that Easter is about the resurrection of Jesus and not chocolate bunnies. Still, I find this kind of thing funny. On Tuesday I got a morning telephone call. I was still sleeping at the time, so what I was about to hear didn’t make much sense to me. I was told I was supposed to come pick up some information that I needed. “Who are you?” I asked. “This is the blah blah blah Center,” she told me. Never heard of it. “Have you bought stock?” she replied. I wrote down the address (some place in Xujiahui) and got the phone number. Then I forgot about it. The next day the woman called back and asked why I hadn’t come and picked up the information. This time I was more awake, so I demanded more information. Who was this? Again, the blah blah blah Center. Meaningless. I decided to be a wuss and put my girlfriend on the phone to get to the bottom of it. My girlfriend ascertained that the woman didn’t know what insurance I had or even what my name was, but still insisted that I needed the information. It didn’t matter that I wasn’t Chinese. My girlfriend asked why my insurance agent hadn’t notified me about this, and she was given some excuse. My girlfriend asked why it couldn’t be mailed or sent by courier. It just couldn’t. It all seemed veeeeerrry fishy. I called my health insurance company (AIA), and my agent told me she didn’t know anything about this “financial information” I supposedly needed. She advised me to ignore this woman. She thought that if I went to the address they would probably try to sell me some kind of fake insurance. Well, the conwoman called me again for the third time today, wanting to know why I still hadn’t picked up my “information.” Even though I wasn’t planning on going in, my girlfriend already told her yesterday that I’d pick it up tomorrow. Since I was now convinced that it was some kind of scam, I yelled at her and told her I knew it was a scam and to never call me again. I’ve gotten very few telephone solicitations in China, let alone such a bold telephone scam. Does anyone have experience with this kind of thing? Recently I set up the little artificial Christmas tree my girlfriend bought for my last year. When I went to put the Christmas lights on it, I found that one of the wires had come disconnected from the switchbox. I probably wouldn’t be able to fix it without a soldering iron. Since I didn’t have time to get new Christmas lights, I just left the tree plain. The next day my ayi came over and I pointed out the Christmas tree to her. I thought maybe she hadn’t seen a Christmas tree in someone’s home before. She proceeded to good-naturedly advise me that it was too bare, and I should get more ornaments and lights to decorate it properly. I just smiled and agreed with her. On Wednesday I went to a party for the Chinese department teachers of ECNU. (I’ve been teaching them English at their request, and it seemed like a good excuse for a party). The party was held in the nice home of one of the teachers. She had a real Christmas tree! It was the planted kind, and it was decorated in a simple but nice European style. I had wanted to buy eggnog to share at the party, and I was pretty sure it could be bought at City Supermarket, but it turned out that City Supermarket had no holiday foods at all. Same goes for 久光, the supermarket near Jing’an Temple that carries mostly Japanese imports. Both supermarkets were fully decked out in Christmas decorations, but neither contained a single Christmas-themed food or drink item. Even Starbucks, with its overpriced (158 RMB, I think?) gingerbread house had more to offer. So instead of eggnog I took a bottle of Bailey’s I had been saving for a special occasion. The party was briefly educational because I brought the mini Nativity scene that my parents gave me about two years ago. I explained who each figure was, and they all got a kick out of the cute little figurines. It seems like the department stores in Shanghai are getting more and more lavish in their Christmas decorations with each passing year. The things are really getting huge. Plaza 66 (a mall on Nanjing Road) has even set up a Christmas ferris wheel. Each “seat” is a case holding some overpriced bag or other item, and the whole things slowly turns, showing off the mall’s expensive offerings. I guess maybe it’s because of all the over-the-top decorations everywhere that I am very content this year with an under-decorated tree and a very simple Christmas celebration. I really don’t like the card game that they always play, so I just kind of hung out and watched. And even though my girlfriend taught my whole family how to play mah jongg over the summer, I kind of forgot, and was a little embarrassed to play with people that really knew how. Yeah, a pretty sad attitude for someone who’s lived in China as long as I have, but what can I say? I just didn’t feel like playing those games. For dinner we ordered pizza and Chinese food. After dinner things got more interesting. Someone suggested we all play Mafia. I was happy about that, because I knew mafia is a good game. I figured we could all have a good time with it. What I never imagined was how long we would all end up playing it. We started at about 8pm with 9 people. There were two mafia every round. A few people had never played before (my girlfriend included), so it took a little while to get going. The guardian angels were especially bad at first, but when the guardian angels started doing a better job, everyone else started relying heavily on them to deduce who the mafia were. Some people got really serious about the game. Some rounds took 30 minutes or more (with only 9 people total!). There was no alcohol involved at all. I had a good time, but by about 3am I was pretty tired and ready to quit. Yet no one was leaving! So I had to be a good host and keep playing. The game didn’t end until 5am. 5am! These were not college students… they were all young professionals in their mid- to late twenties or older. I never expected them to stay so late. Like I said, I had a good time (it’s a great game), but I never imagined I would ever play 9 straight hours of Mafia. Damn. So there’s this show called 超级女声 which the Chinese abbreviate to 超女 and most people call “Supergirl” in English. (Danwei.org, on the other hand, calls it Super Voice Girls.) The show is a lot like American idol. This season it has been immensely popular all over mainland China. Viewers can vote for their favorites by text messaging with their cell phones. This past Friday was the final installment. A huge proportion of China’s TV-watching masses were tuned in. Inspired by Micah’s entries, I thought it might be a good thing to watch. It couldn’t hurt my cultural understanding of China to watch something that so many Chinese folk were going gaga over. So I suggested to my girlfriend that we watch it. To my surprise, she hadn’t seen a single episode, but she agreed to watch it with me. We decided to watch it at her place with her parents, since they were into it. Friday morning she asked that I also bring over the PS2. She said we could play video games first, then watch Supergirl. I agreed to that. So I came over with the PS2 around 5pm and we were soon very engaged in a cool Japanese fantasy game called Ico, taking turns playing it. Soon it was dinner time. We ate, and then went back to the game. When 8:30 rolled around, my girlfriend didn’t want to quit playing the video game to watch Supergirl. I didn’t really, either, since we were close to beating Ico and I didn’t want to miss the end. Supergirl ran something like 2 1/2 hours, so we decided to play for a while longer. As her parents started watching in the other room, the sounds of cliche, over-played songs started coming out of the other room. > No, I’m really not interested. What’s so special about that show? There have been a million other shows like it, and they’re all the same. *I* can sing as well as some of those girls! Sorry, I’ll pass. So I caught the tail end, and she didn’t watch any of it. To my surprise, the cute one got the least votes, and I thought she sang the best. The worst singer won. And it wasn’t very interesting watching. My girlfriend made a good point: there really wasn’t anything unique or revolutionary about the show. It was actually in its second season, and received little attention its first season. Why was it so popular? I wanted to watch it to find out what all the hype was all about, but I think I should have just followed my girlfriend’s lead. She’s pretty smart. So then we beat Ico. Cool game. 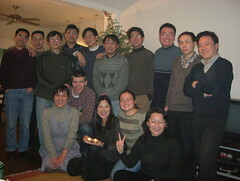 The next day my girlfriend invited 9 friends, male and female (all Chinese), over to my place for a little party. I asked them how many of them watched the final episode of Supergirl. They all did. I think my girlfriend is the only Chinese person I know that didn’t watch a single episode. She wanted to play PS2 instead. She’s pretty damn cool. I hate celebrity gossip. I think it’s the stupidest thing. Why should we care about that stuff?? What bugs me the most is when I realize I am actually somewhat following it. I don’t want to, I don’t mean to… how does it happen?? I find it even more ludicrous that Chinese people sometimes also follow the celebrity gossip of Hollywood stars. Yeah, I shouldn’t be surprised, in this age of international media… but still. It’s ridiculous. > Me: So you wanna watch a DVD tonight? > Her: What DVD were you thinking? > Me: How about Mr. and Mrs. Smith? > Me: Oh yeah, you saw that already… You didn’t like it, right? > Me: Haha… Not “Peter”… It’s “Pitt!” Brad Pitt! > Her: Right… he left that one girl for the woman in this movie. > Me: Oh, right. He left his wife Jennifer Aniston for Angelina Jolie. > Her: Right. Because of this movie! > Me: So you don’t like it because you don’t like him. > Her: Which one would you choose if you were Brad Pitt? > Her: I think I would choose Angelina Jolie. She’s younger and sexier. > Me: (relieved) Yeah, me too. > Her: Men always go for the younger woman. Like Tom Cruise. > Her: I think they’re kind of a cute couple. > Me: What?? Why don’t you hate Tom Cruise? He did the same thing that Brad Pitt did. He was married to Nicole Kidman, and then he did a movie with Penelope Cruz and divorced his wife. And he didn’t even stay with Penelope Cruz long! > Me: Yeah! And plus he’s crazy! > Me: Yeah, you haven’t heard? > Her: I heard that he and his girlfriend are having some troubles. One reason is that it’s Tom Cruise’s third wedding and he wants to keep it small and simple, but his girlfriend would like her wedding to be a big affair. > Her: So Tom Cruise is really crazy? > Me: So it seems. There are all sorts of clips documenting it on the internet. Wanna see? 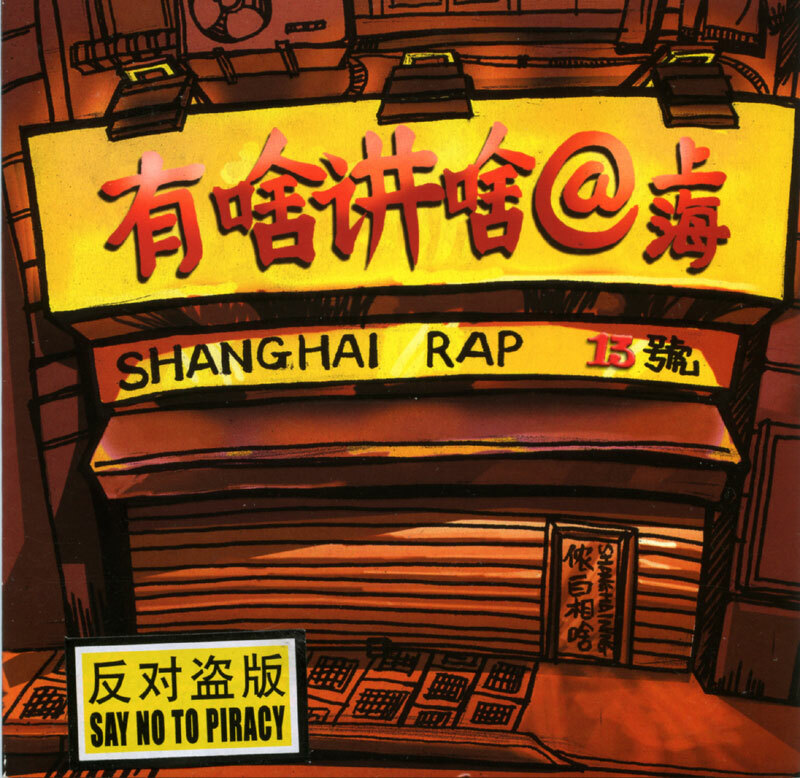 I may have posted about Shanghainese rap once before, but I normally only listen to rap or hip hop occasionally. Still, the one time I went to a hip hop show at Caesar’s Pub (since closed) with my girlfriend, Brad, and a few other friends, we had a really good time. So when Brad mentioned to me that ShanghaiNing was throwing a CD release party, I was happy to go. I don’t have a lot to say about the actual event… Obviously, the fact that you can get a record deal (with Sony BMG) doesn’t really mean your music is better. 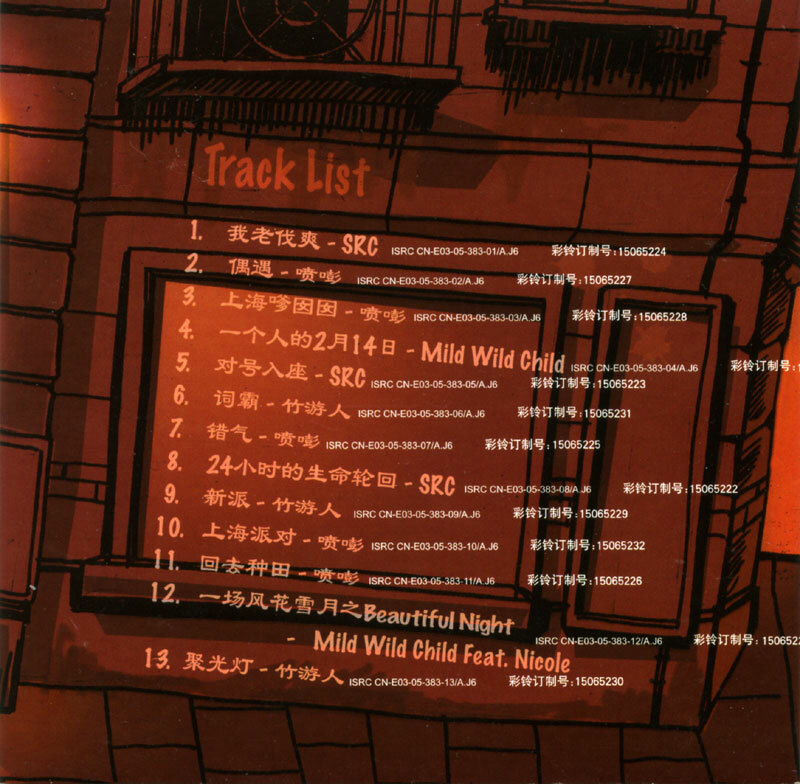 I heard a few songs I liked, and also got an earful of awful “hip hop English.” Some of the songs on the CD are not bad, however. Shanghaiist also has a report on the event. This is just the beginning of China’s rap/hip hop scene…. From July 4th to July 16th, my girlfriend stayed with my family in a suburb of Tampa, Florida called Brandon. We had a great time, and they all loved her (of course). I’ll probably be writing about that visit a few times, but first I just want to talk about her reaction to American food. She has to travel to other countries for her job, so my girlfriend is no stranger to Western food. She likes cheese and pizza — she’s not one of those Chinese people that can’t get used to a lot of Western foods. (She’s a Shanghainese girl!) She was excited to be able to discover what kind of food my family ate, as the American homes she had eaten in before had all been families of Chinese immigrants in L.A., and they ate mostly Chinese food. In the end, there were a few things she couldn’t get used to in two weeks’ time. The first day, my mom gave us beef and barley soup with cold cuts sandwiches for lunch. She loved that stuff. She didn’t know Americans could make such a good soup (good job, mom!). One night we had a make-up Thanksgiving Dinner, with turkey, stuffing, mashed potatoes, cranberry orange relish (a family specialty)… the whole thing. I don’t think my girlfriend is too crazy about turkey, and she didn’t get into the gravy much (mmm, gravy…), but she enjoyed that meal. She just felt like it was so much food. She told me my appetite seemed to increase when I got home. Damn right it did! She liked the chilli my mom made. And she definitely liked my sister Amy’s Asian fusion stir fry. Those two nights, though, when the dinner consisted of mainly one big dish, gave her a mistaken impression about American food. She thought that was the norm because we really didn’t have that many dinners at home. I had to explain to her that (in my family, at least) there are usually at least three or four dishes, but occasionally one dish will dominate the meal. She enjoyed the meals less on the nights we ate out. The food she got at the Akershus “Princess Palace” at Norway in Disney’s EPCOT Center wasn’t that great. My food was good, though. What made that place amusing was the five Disney princesses that came out and chatted with you and took pictures while you ate. The five princesses of the day were Cinderella, Ariel, Jasmine, Sleeping Beauty, and Belle. Sitting there, I realized that the dining epxerience was meant for five-year-old girls. Whatever, though — Jasmine was hot! We learned from our experience at Busch Gardens that meal portions at the fast food-type restaurants are way too big, and we were better off sharing one entree and getting a few side dishes. That worked well for lunch at SeaWorld. The pasta dish she ordered at Sharks Underwater Grill was a little rich, and the immensity of the appetizer shocked her. The jumbo shrimp I had there were the best shrimp I’ve had in a looong time, though. Chinese restaurants take great pride in having only the freshest seafood, but why is it so rare for me to eat such tasty and succulent shrimp in China for a reasonable price? OK, rambling. The night we made dumplings (饺子) dinner was good, of course. We made so many we had to freeze half of them. (You guys better remember to eat those!) Unfortunately I earned extreme contempt from my girlfriend for my creative 包ing efforts. I tried all kinds of cool new 包 techniques. No one was impressed. Oh well, they still taste the same when they look ugly. Oh, and fresh, crisp American corn on the cob was well appreciated. Unfortunately, I couldn’t get her to smother it with butter (the way it should be eaten). 12 nights of dinners, and I’m having trouble recalling many of them. Anyway, my girlfriend wasn’t crazy about stuff with rich creamy or buttery sauces, but she liked most stuff. The one meal she really couldn’t stomach, though, was one of my favorite meals of the entire visit. It was the bagel brunch. The morning of the 16th my mom went and bought fresh-basked New York-style bagels at Brandon Bagel. According to my neighbor, it is the only source for delicious authentic bagels in Brandon. So, with my neighbor, my mom got the everything bagels, the pumpernickel bagels, the salt bagels, the honey wheat bagels, etc. They got cream cheese with chives, veggie cream cheese, cream cheese with lox, and some kind of cinnamon cream cheese. We also had fresh sliced tomatoes and onions for additional toppings. I was in heaven. Normally I have little appetitite in the morning so I eat only one bagel for breakfast, but I had three bagels (six different halves) that morning. But my poor girlfriend didn’t like them. She felt the bagel bread was too dense and the cream cheese was just too much for a breakfast item. I pity her. Thinking back, though, I used to be unable to stomach a lot of fried Chinese breakfast items, like 煎饺. I am finally back in Shanghai today. It has been a very full past two weeks. I like the Seoul airport. It has good food, and a nice internet cafe (or “Internet Plaza,” as they call it) for US$3 per hour. I used that one on the way to the USA, but this time on the way back my girlfriend and I found the transit lounge (it’s up one floor), which offers free internet access. Nice computers, too. I also experienced Korea’s most beloved of televised competitions: the Starcraft competition. Pretty crazy. I remember when I first arrived in China in 2000 Starcraft was still pretty popular, but I don’t see it on many screens in the wangba these days (although, admittedly, I don’t find myself in Chinese wangba much anymore). China has moved onto other games, like WoW (speaking of which, check this ad out). Korea is not nearly as fickle as China; it has remained steadfast in its obsession despite the fact that Starcraft is already 7 years old. I have always liked Starcraft, and I still play a round from time to time. I think it’s my favorite computer game ever. But I still don’t think I would cry on national television if I lost a Starcraft competition. I guess I just don’t understand Korea.